Protect your head! Protect your hands! Look at our amazing collection of hooded scarves with mittens and children’s hats. All of our hooded scarves come with mittens on the end of them so you can keep your hands warm and stylish at home, outdoors or even at a rave. Our hooded scarves are adorned with a variety of animals such as moose, bears, tigers and giraffes so you can fully embrace your wild side. Let the world know that you have a lion’s heart, a bear’s strength or a moose’s grace under pressure! 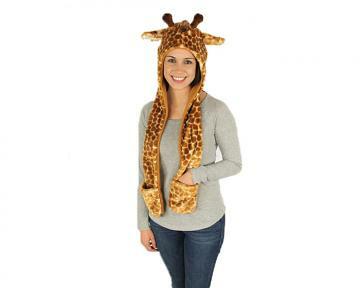 Finally, there’s a way to wear a scarf on our heads without being judged. Our hooded scarves are truly ground breaking. Though our mittens are mostly attached to hooded scarves, our children’s sock monkey mittens match our sock monkey hat. It’s a combination guaranteed to brighten any kid’s day. 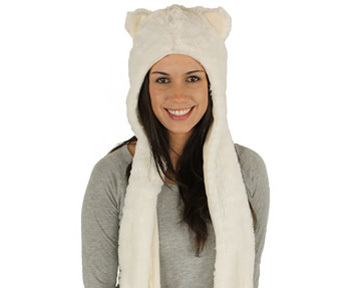 Whether your hands are jonesing for cover or your head is feeling a bit unloved, we have the mittens and hats for you.